How Duke and Florida Gulf Coast got their star players. This was Duke's star forward Mason Plumlee back in high school. He was one of the highest ranked players in the class of 2009. He was a McDonald's All-American. 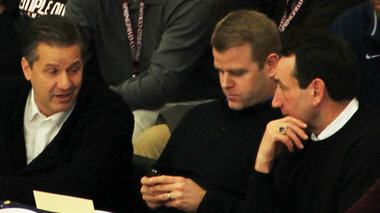 Top college coaches sat courtside at his high school games. He had scholarship offers from top schools across the country. His whole freakishly athletic family eventually decided to become Dukies. This was FGCU guard Sherwood Brown in high school. This was his highlight tape. Top college coaches never came to his games. This what happens when you search for Brown on recruiting websites. This week, both players have a chance to lead their teams to the Final Four. Duke worked for years to ensure Mason Plumlee ended up wearing a Duke uniform. FGCU got lucky with a flyer.